My father and brother play golf. They are, rather annoyingly, naturally competent. A few years ago, they once took my husband out, reluctantly, for an 18 hole game. I’ve never seen him so miserable upon his return. When I suggested to to my husband that we give the beginners classes at Worthing a go and learn together, he was a little sceptical at whether he’d be any good, especially after his traumatic experience with the in-laws, but was happy to try it out and at just £35 we thought it was very good value. So we went along to our first lesson on Saturday and we thoroughly enjoyed it! The six of us in in the class were all beginners and it was very relaxed and informal. Mike, the head pro, let us get stuck in, hitting (and missing) some balls so he could evaluate our stance, grip and swing and give us some tailored feedback. "Mike really cares about encouraging people to get into golf"
With some basic knowledge on the correct technique, we could all see the improvement, even in just an hour which was really encouraging. Whilst I did find it frustrating to keep hitting balls off to the right for a while, when it did go straight and in the air and past the 100 yards marker, it really did feel pretty special. I was actually surprised at how much I enjoyed it - not only trying something new but also being out in the fresh air on such a lovely course and having fun with a nice small group of people. It was a refreshing and lovely antidote to an otherwise pretty hectic life as a busy mum, working full time and running my own business. "We could all see the improvement, even in just an hour." 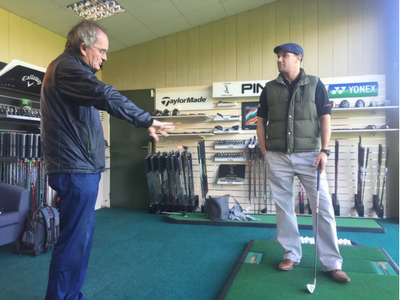 As a coach, Mike is really lovely, very patient and his passion for golf really shines through when he talks, which kept our whole group engaged throughout the class. We were all delighted to be told we could take our clubs home to practice, which I thought was a really nice touch and goes to show just how much Mike really cares about encouraging people to get into golf. I’m happy to say that after just an hours lesson, Mike’s passion for the game had rubbed off, I wasn’t as bad as I thought and my interest in the game is certainly piqued. My husband was back up at the driving range the next morning with a bucket of balls to practice what he’d learned. I think he’s been bitten by the golfing bug! Either that, or he’s just feeling fiercely competitive and keen to hustle my dad and brother in their next game.